Yet another grave from Cemetiere Montparnasse. 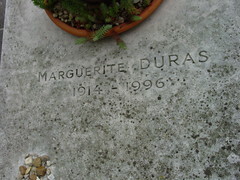 As you walk through the front gate of the cemetary and hang a left past the information bureau, you'll see Marguerite's grave. There were two potted flowers on top of the stone, but otherwise it was an unadorned grave compared to some of the others we saw. I think it's time to re-read The Lover. She's always been one of my favorite authors.